The folks who made the popular animated movies Coraline and ParaNorman are at it again. The Boxtrolls falls a trifle short of previous Laika Studios work, but still manages to be both entertaining and distinctive, an expression of the appealingly cracked thinking we’ve come to expect from Laika. This time, Laika imagines an inherently absurd world in which status in the town of Cheesebridge is signified by white, stovepipe hats that look as if they’ve been borrowed from Dr. Seuss. True to the town’s name, cheese has become the currency in which the status-hungry deal. Nothing in Cheesebridge exceeds the privilege of gathering in a tasting room to sample fine cheeses with other White Hats. 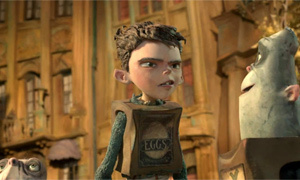 Loosely based on author Alan Snow’s Here Be Monsters, The Boxtrolls focuses on a boy named Eggs (Isaac Hempstead-Wright) who lives among the Boxtrolls, lumpy-looking creatures who wear cardboard boxes and who run around the city scavenging from garbage piles. For nourishment, the trolls pop multi-colored insects as if they were M&Ms. They also collect discarded objects from alleys as a way of furnishing their underground home. Of course, the Boxtrolls have a nemesis. An exterminator named Archibald Snatcher (Ben Kingsley) plans to eliminate all trolls. In true fairy tale fashion, he libels the poor creatures, blaming them for capturing and killing children. Unwilling to wait for an elevated status, Snatcher sometimes gains entry into society’s loftier regions by dressing in drag and posing as Madame Frou-Frou, a singer in full chanteuse regalia. Snatcher hopes to shed his disguise and become a bona fide member of the White Hat society so that he, too, can feast on fine cheeses with Lord Portley-Rind (Jared Harris). A cheese obsessive himself, the snooty Lord Portley-Rind pretty much ignores his young daughter (Elle Fanning). Left to her own devices, Fanning’s Winnie meets Eggs, and the two eventually join forces to save the Boxtrolls and bring balance to a world gone lopsided in its quest for status. The world we discover in The Boxtrolls tends to be darkly hued, a look that isn’t helped by 3D, which proves entirely superfluous in establishing the Dickensian mood directors Anthony Stacchi and Graham Annable seem to be after. I would have preferred a less action-oriented finale, but The Boxtrolls, with musical numbers by Eric Idle, has a fair share of off-kilter charm. Be sure to stay put for the end credits, which are both amusing and instructive.